February 2013 - McFarlane Toys' Collectors Club continues to bring fans the most exciting statues ever created and our next resin statue is a true collector's dream. Michonne from The Walking Dead's comic book is the next to join McFarlane Toys' line of limited-edition resin statues. 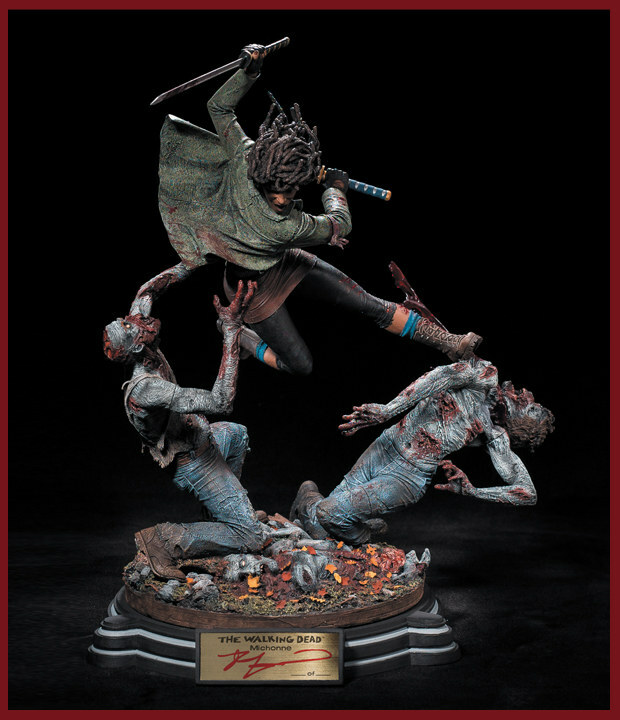 The meticulous sculpted and hand painted statue, captures Michonne, the woman transformed by pain and loss, as she is thrust into the role of a badass zombie warrior, as she battles endless hordes of flesh-eaters in an unforgiving post-apocalyptic world. The beautifully-detailed piece shows fan-favorite Michonne doing what she does best, killing walkers with not one, but two swords! The statue stands approximately 14.5 inches high and comes with a 360 degree rotating, highly-detailed gory base, so you can view the gruesome action at every angle! This statue is limited to no more than 1,500 pieces, with each sequentially numbered piece being hand-signed by The Walking Dead creator Robert Kirkman. As an added bonus, each box will include a Certificate of Authenticity signed by Todd McFarlane. "Obviously, the sculpting team at McFarlane really outdid themselves. I think this is a really remarkable piece of art," says "The Walking Dead" Creator Robert Kirkman. "Michonne is a very cool character – she's definitely the most action-oriented character from the series, and I really liked the idea of letting the McFarlane team run wild, and do their own take on Michonne." With acute attention to every decaying detail the Michonne statue was created, developed and designed by Todd McFarlane and his award-winning McFarlane Toys design group, in conjunction with Robert Kirkman and Skybound Entertainment. This resin statue is planned to ship 3rd Quarter 2013. Customers will not be charged until the order is shipped. The McFarlane Collectors Club is an online store where US and Canadian customers can purchase current and past McFarlane Toys' products, along with EXCLUSIVE figures and resin statues, with some only offered through the collectors club. All you have to do is create a new customer account – No purchase necessary and no membership fee. Once you have created your account, you may order any items we have available on our website. McFarlane Toys online store and Collectors Club program will bring fans arguably some of McFarlane's coolest figures and resin statues ever! Our resin and 6-inch figure program will feature franchise properties with worldwide name recognition including HALO, Spawn, Haunt and The Walking Dead Comics, along with star players from the NFL, MLB, NHL and NBA.